Welcome to the Swing Time Big Band Website. When “elegance” and “class” are the watchwords for a special event, formal wedding or landmark corporate fundraiser, there is no entertainment alternative to a swinging big band. If you have never experienced a well-rehearsed, high-powered band of 17 swinging musicians making a musical statement, you are in for a treat! For over 25 years, the Swing Time Big Band from Cleveland, Ohio has routinely delivered top-shelf performances year-in and year-out throughout the country clubs, reception halls and party centers throughout Ohio. Whether performing at the Ohio Governor’s Inaugural, the 2016 Republican National Convention, or any of the myriad balls, weddings and corporate events at which Swing Time has performed over the years, the band prides itself on a fiery brass section, a “smooth as silk” sax section, and a swinging rhythm section to keep the crowd moving – and enjoying the moment! When you add the sensuous vocal stylings and sheer intensity of featured singer Anna Givens to the mix, you have a crowd-pleasing recipe for a dynamite evening!! 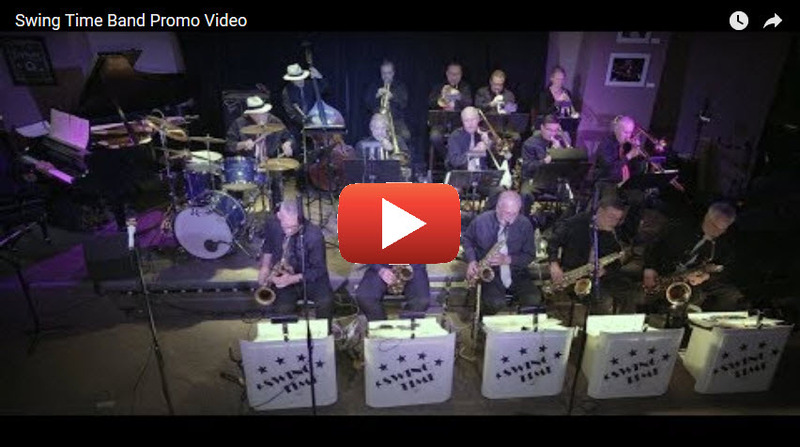 “True to the era, true to the music” – the Swing Time Big Band delivers the authentic arrangements from Count Basie, Duke Ellington, Tommy Dorsey, Stan Kenton, Glen Miller and so many, many more – the way they were intended to be played and enjoyed. With a song book of over 500 tunes, this is a band your guests will want to hear. But don’t take our word for it . . . let your own ears convince you! Enjoy! !